Turn lines of text into a bulleted list by selecting the text and then clicking Home> Paragraph> Bullets. Each line or paragraph becomes a bullet in the list. Tip: Press Enter to move text to its own line, or press Enter twice to end the bulleted list. Starting with a blank page? Place your cursor where you want a bulleted list. Click Home> Paragraph, and then click the arrow next to Bullets. Choose a bullet style and start typing. 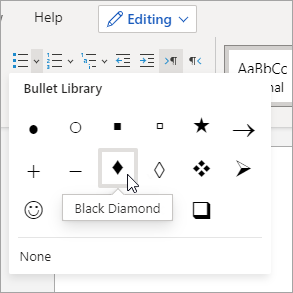 Press Enter every time you want a new bullet, or press Enter twice to end the bulleted list. Tip: Word can create lists as you type. When you start a paragraph with an asterisk or a number 1., Word decides that you want to start a bulleted or numbered list.